Supreme Memorials, Inc. is a family owned and operated full service memorial center. Our family has been erecting family monuments, grave markers, and private mausoleums since 1951. As we enter our fourth generation, we still have the same values of service and painstaking craftsmanship that our founders based the company on. Supreme Memorials has three convenient locations in a historical area of Brooklyn New York, as well as two locations in Staten Island. You are welcome at any time to visit the largest indoor display of monuments and grave markers in New York! Rosario and Carmine Cassara founded Supreme Memorials in 1951. Both Italian Immigrants, Rosario and his son, Carmine, would split the long 15 hour days between the two of them. Rosario opened the shop at 7:00 am and Carmine would close at 10:00 pm. At the time, the only products we were offering were Gray Granite and White Marble. All work was hand carved. Carmine was proud of the painstaking craftsmanship he put into every memorial he designed. He also wanted the customer to know that they were buying a product that was second to none. “Buy Direct and Save” - It was a revolution. Carmine wanted his customers to have the best value, so he started importing the marble from Italy and the granite from Vermont with no middlemen. Four generations later and we still implement that same policy. We now offer as many as 17 different colors from around the globe. Carmine’s son, Frank, introduced different colors of granite to our showroom. 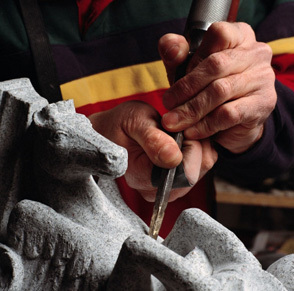 We now have many designs and a majority of our work is still hand carved. Now, with new technology, we are able to create truly custom memorials. 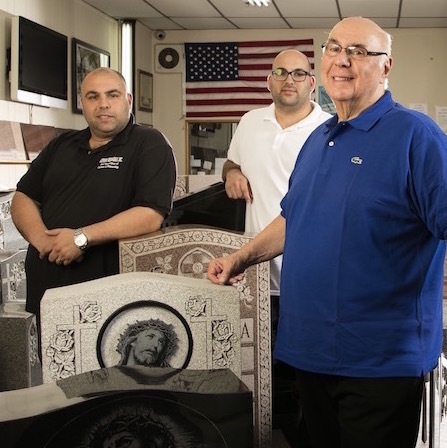 Carmine was proud of the painstaking craftsmanship he put into every memorial he designed, so are his grandsons Joseph and Michael.